Our train to Leipzig and on to Bamberg via a connection has just left Dresden Hauptbahnhof, on time as usual. This morning, we got up at 06:30 and headed straight down to breakfast. I stuck with more healthy options today, avoiding the meats and cheese and scrambled eggs and sausages on offer. But the dessert today was a cheesecake with some sort of green fruit or something in it. I would have called it rhubarb if it was at all red, but it was a pale yellow-green colour. Celery was the closest match I could come up with for its appearance, but when I tasted it, it was sweet. Then Michelle said, "Is it asparagus?" and I had to reply, "You know, I think it is." We packed and checked out, leaving a Flickr photo card at reception. 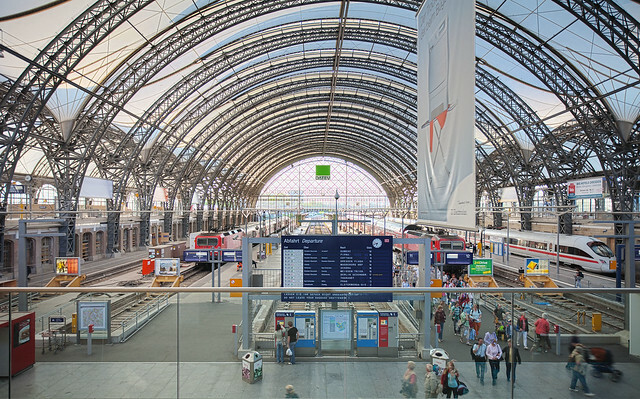 We wandered out to the Hauptbahnhof and bought some sandwiches and pretzels for eating on this morning's train journey. And now we are passing through the Saxon countryside, looking out over views of gentle hills planted with flax in bright yellow flower, alternated with grassy fields, patches of forest, and little country towns. There are also large clusters of modern power-generating windmills. We are now pulling into Riesa, halfway to our change of trains in Leipzig. Note added on 10 November, 2007: I've just been reading Michael Palin's New Europe travelogue. He was travelling around the former communist bloc Eastern Europe countries, from late 2006 to early 2007. The last country on his trip was Germany, where he visited sites in the former East Germany. 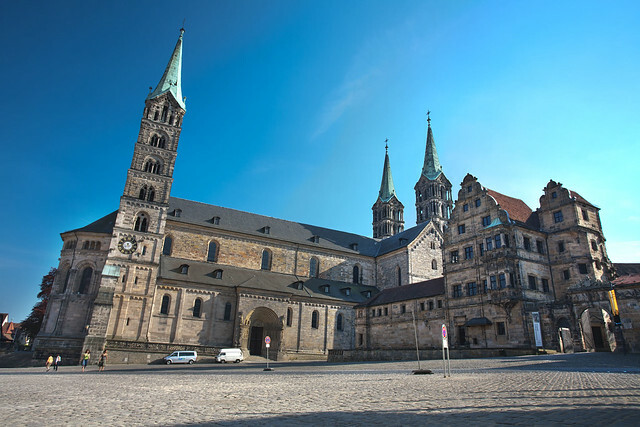 The first German city he saw was Dresden. Michael Palin arrived in Dresden on 26 April, 2007. That is, today in this diary. We joined this train in Leipzig not long ago. We were assured that the connecting train would be right across the platform from where we pulled in on platform 10 by a Reiseplan brochure on the train, however our train arrived on platform 9, giving us a frantic few minutes of walking the length of the platform to the main concourse, finding platform 11, then panicking when the indicator board didn't contain anything that looked like our train. But as we stood, gaping and wondering what to do, laden with all our bags, the sign changed and the ICE 1407 to Munich appeared. So we walked up the platform, locating a poster indicating our car was near the far end of the platform. But when the train pulled in a minute later, Michelle noticed the number of our car passing us, destined for the end of the platform nearest the concourse! One mad scramble later, we were safely ensconced in our seats, hearts still thumping at the prospect of having missed our train. Amazingly again for DB, the train pulled out of Leipzig four minutes late. We're now passing by a hillside along the track, planted with rows of grapes. A few minutes ago there was a huge industrial complex with giant storage tanks, chimneys, and so on, as well as more windmills. We have a 2:30 trip on this train ahead of us. A display at the front of the carriage shows our speed, which has topped 200 km/hr at times. Wow! What an afternoon. Our train arrived at Bamberg a minute or so late, and we scrambled off with our bags. First order of business was to find out just where the heck our hotel was, the Hotel Brudermühle. It wasn't one recommended in the Lonely Planet. We had trouble finding a place with a room free and resorted to an Internet search to find this one. The address on the e-mail from them was "Schranne 1" - at least I assumed that was an address. We asked an information counter at the station, and the lady there showed us on the map in our Lonely Planet where Schranne was, right in the middle of town and a good distance from the station. She advised us to get any bus outside to the Zentral Omnibus Bahnhof (ZOB), where we could change to an 8 or 12 bus to take us to Schranne. We waited a bit for Michelle to finish a coffee she'd bought at a place near the info stand, then emerged into the hot sunlight to cross the street and walk down a little way to a green bus stop. A bus pulled up almost immediately and then we tackled the difficult problem of explaining where we wanted to go to the bus driver. He asked a question, but I could do no more than say apologetically that we spoke English. The driver immediately turned around and yelled to the passengers already on the bus, asking if anyone spoke English. A teenage boy came up and asked the driver what was up, and the driver said something. The boy asked us in absolutely flawless American-accented English if we had just arrived by train. When we said yes, he explained that meant we only had to pay half fare for the bus: €0.60 each. We handed over the coins and received a stamped ticket from the driver, who then waved us aboard, closed the door, and drove off. Two stops and a little more than a minute later, we pulled up at the ZOB and everyone got off. We walked around the corner to find a large bus interchange. We found a spot for bus 12, but it was occupied by a bus of a different number. Spying a timetable poster, I discovered that bus 12 only ran once an hour, and the previous one had left 5 minutes ago. So we wandered up the terminal looking for which stand served bus 8, but never did find it. We gave up and decided to walk the rest of the way, figuring it couldn't be too far. Stopping several times to consult the suddenly woefully inadequate Lonely Planet maps amidst the tiny twisting streets of the medieval town, which showed main streets and none of the tiny pedestrian alleys that served to connect them all together, we managed to navigate a rather zig-zag route across the Alte Kanal and then across a bridge to Schranne. At various points along the way, we would run across various four and five star hotels, looking extremely appealing to our weary bodies lugging all our gear along. I would say each time to Michelle, "See that hotel? That's not ours." When finally we reached Schranne, the first building I saw was an equally inviting but very cosy looking establishment in an amazing old but obviously immaculately looked-after building. 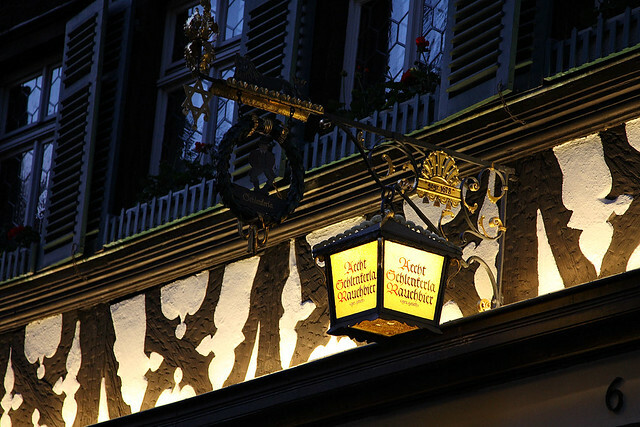 There was an obviously fancy restaurant on the ground floor and the upper levels were plaster with gorgeously shuttered wooden windows and another row of windows poking out of a steeply sloped red tile roof, the whole decorated with elaborate carvings, statues, and intricate wrought iron light fittings. I said, "See that hotel?" But no I wasn't. We checked in and the very friendly young woman at reception showed us up to our room (Number 12 again like in Dresden) on the top floor. She spoke only a few words of English, but we managed to get things across clearly. She asked us if we were staying for one night, and when I said no, two nights, she checked the bookings and changed us to a different room. The room that we thus got by way of this turn of fortune was cosy, but very nicely appointed. The woman apologised that the bed had been made for one person, and said it would be remade while we were out, then she left us to settle in. There was an odd noise coming from the windows, so I went over and opened it fully, letting in the roaring sound of rushing water from a flood sluice in the river immediately below our window. 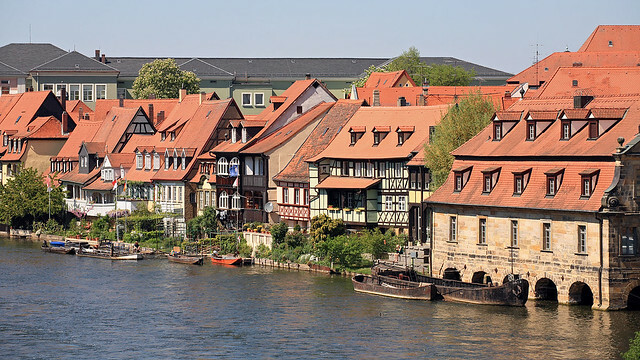 Not only that, but we have a view directly over to the Alte Rathaus in the middle of the river, on a bridge not 50 metres away - the number one iconic landmark of Bamberg. What's more, there is a very cool dragon shaped waterspout jutting from the gutter right near our windows. All up, this is one of the coolest hotel rooms with the most spectacular views I have ever stayed in. After leaving our bags in the hotel, we launched ourselves on a no-holds-barred walking tour of the lovely town of Bamberg. 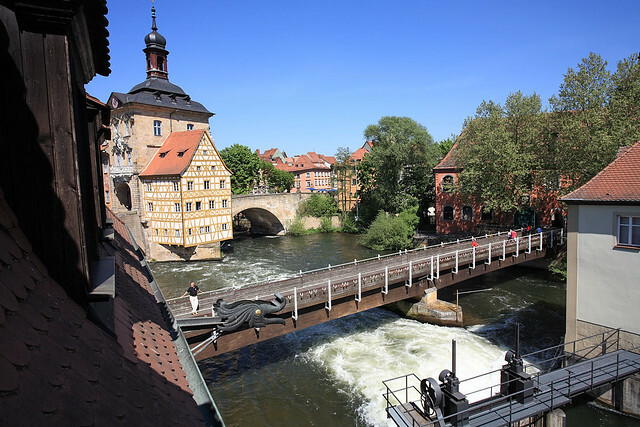 The first thing we did was walk north from Schranne, then east across the Obere Brucke, the bridge passing through the Alte Rathaus on the River Regnitz. 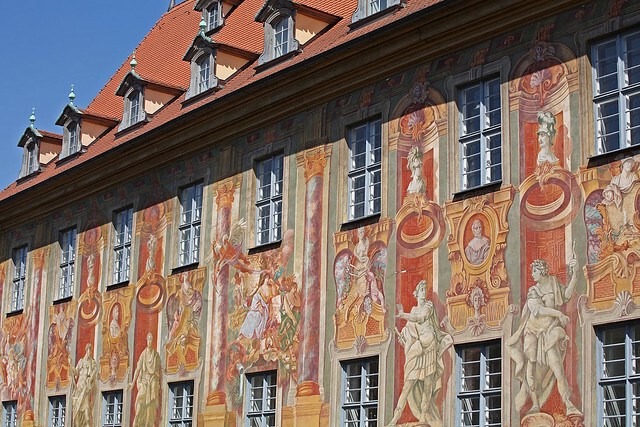 The Rathaus presents a stunningly fresco-painted exterior on both sides, sitting picturesquely astride the bridge in the middle of the river. Passing through the tunnel through the Rathaus, we continued over the remainder of the bridge to the Obstmarkt area, then turned left to walk up Am Kranen along the river, admiring the view across the water and up the hill to the steeples of the Dom and St Michael's Monastery above. 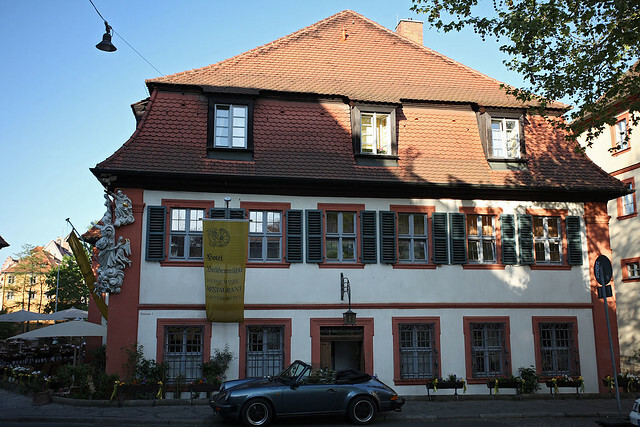 We continued north up Kapuzinerstraße, then turned left into Fischerei, which was a quiet lane flanked by old half-timbered residences. We crossed the river again to the west side on Markusbrücke and walked south along the bank opposite the picturesque Klein Venedig, a small version of Venice, with colourful houses right against the water, barber poles, and moored boats. After seeing Little Venice, we turned up Kasenstraße to Obere Sandstraße, which showed why it had that name, as it was in the middle of being dug up and below the cobblestones was a thick layer of hard-packed yellow sand (actually, I have no idea if "Sand" means the same thing in German at all, but it makes a nice story). We wanted to get to the Rosengarten, a garden partway up the hill that apparently affords a great view over Bamberg. We climbed the stairs at the end of a narrow lane of Obere Sandstraße to emerge in Ottoplatz right next to the Rosengarten, but several metres below it at the bottom of a sheer wall with no apparent way up. Looking south at the wall before us, sloping streets led up to the right and left. We chose the right, heading west up a pedestrian way: Aufseßstraße. While walking up, a group of boys about 12 years old asked us where the Rosengarten was (in German). I explained we spoke English and didn't really know, but we were trying to get there ourselves. They seemed satisfied enough and raced ahead of us. I didn't realise until a bit later when I looked at our map that we'd actually walked quite some way away from it. We turned south on Michaelsbergerstraße towards Jakobsplatz and the large church of St Jakob, which we popped inside for a look at. From there, we continued up Obere Karolinenstraße to Storchsgasse, which we took north to the monastery of St Michael. Storchsgasse was a tiny, narrow laneway between beautifully painted picture-postcard houses that were clearly several hundred years old. Kloster St Michael was another beast altogether. An imposing edifice of stone, accessed by a cobbled coach gatehouse archway which led into an impressive sloped courtyard containing a fountain with various statues on it, three sides of cloisters (now run as an aged care facility), and the astoundingly towering church of St Michael looming enormously over the courtyard from the very highest spot on the hill. 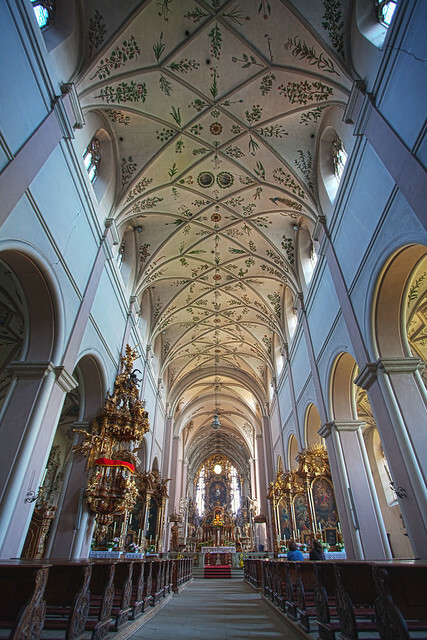 We explored inside the church, noting the detailed paintings of hundreds of plants and herbs on the ceiling. Apparently almost 600 of them, and all used by the monks who lived here for various medicinal purposes (there were also long plots of many of them still growing just outside in the courtyard). 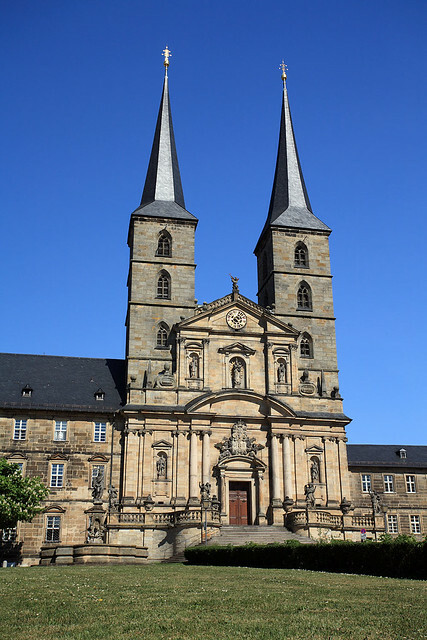 The massive church rewarded exploration with the discovery of the tomb of Saint Otto ensconced behind the altar - apparently Otto is big here in Bamberg because we later noticed small statues, reliefs, and shrines to him all over town. 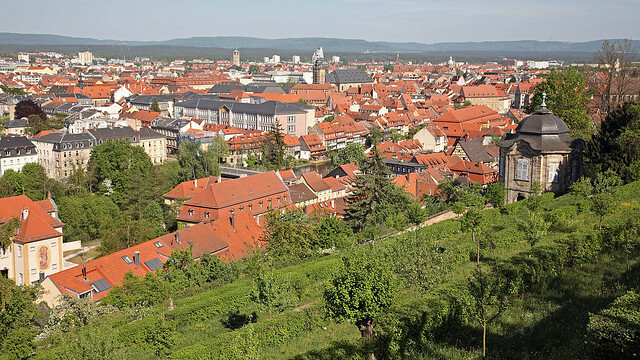 Out of the blissful cool of the church and back into the hot sun, we walked around it to the north and east to the monastery gardens, commanding a stunning view from the hilltop out over the river and red tile rooves of Bamberg below. I asked a couple of women there to take a photo of us and we spoke a few words back and forth in halting German, until the woman switched to a word or two in English. Then when they spoke to each other I noticed it was in French! So then we both ditched our German and spoke English and both parties were much relieved. They took the steps straight down the hill back to town, but we retraced our path through the courtyard and back out to Michaelsbergstraße, which we walked down to the intersection with Aufseßstraße again and then back down to Obere Karolinenstraße, whch we took east as far as Domstraße, where we turned into its narrow, house-lined way. We walked under an archway, through a building, and emerged in the amazing Old Court, a square surrounded by what looked to be the most ancient buildings we'd seen so far. They must have been quite literally medieval. A turn between two of the buildings led us smack into the Bamberg Dom, which we walked along the north side of to the entrance at the eastern end. The inside was, if anything, even more impressively enormous than the outside, consisting of a couple of long aisles down the sides, which were mostly separated from the main central aisle, only having access from about halfway along. 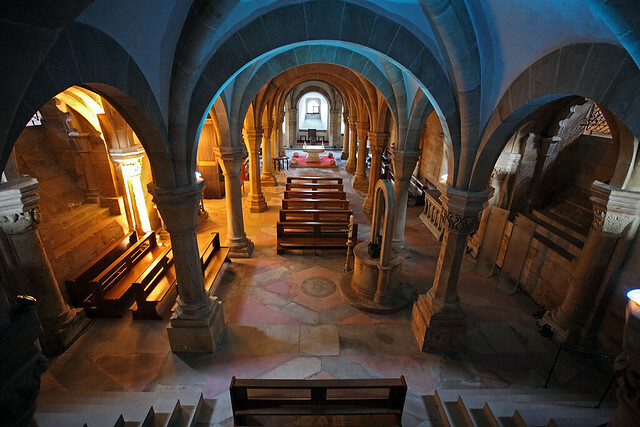 There was a chapel under the new altar, viewable through barred windows at floor level along the outer aisle. The ceiling soared overhead and numerous statues of angels and saints decorated various places. Quite amazing. We continued on down Judenstraße to Concordiastraße, then hung a left down a tiny alley and across a bridge back to the island in the middle of the river, and turned north again up Geyerswörthstraß to return to our hotel via the Geyerswörth garden and another footbridge. We rested briefly, then emerged again to explore the main shopping drag of Grüner Markt over in the Inselstadt area north-east of our hotel, across the river. Most shops were closed or closing at the time, and we found precious little in the way of places to get dinner, so we returned and stopped in at Restaurant Eulenspiegel in Obstmarkt to have dinner. Michelle ordered from the Spargelkarte: asparagus with broccoli, cauliflower, and potato, but asked for no hollandaise sauce. I ordered a regional speciality of Franconia (this area of northern Bavaria): a Frankisches Jägerbraten mit Kemmelklos - roast pork in a mushroom sauce with a Frankish dumpling, which was a large ball apparently made of flour batter and including unidentifiable striations of brown and green through it. Delicious! We returned to our hotel briefly, then re-emerged again to take some early twilight photos, but didn't venture or stay out long, as we planned to get an early night and do night photography tomorrow. And now, my photos are downloaded and I want to let that sound of rushing water lull me to sleep. We have an easy day planned tomorrow. Last updated: Monday, 25 January, 2016; 01:11:58 PST.